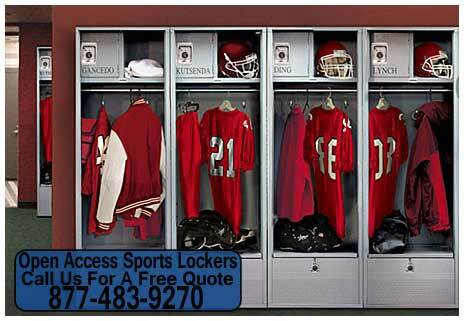 True to our name, XPB Locker Supply carries a complete inventory of sports lockers for organizing athletic equipment. Several lines of metal lockers represent affordable, basic storage that can be installed in any type of facility. Open access lockers offer athletes plenty of room for uniform, equipment, and personal storage. Solid plastic lockers, ideal for humid environments, combine organizing space with impervious protection from moisture. Metal sports lockers continue to be popular in facilities where only basic storage requirement have to be met. They continue to be the most widely used type of locker in public schools. Physical education courses in schools require students to suit out for gym class and to store their day clothes in the meantime. Metal lockers provide plenty of space for personal clothing and personal valuables and are well ventilated to prevent odors from contaminating school clothes. After class, ventilation also allows enough air to circulate through these units so that gym clothes dry out very quickly and are ready for use again the next day. Open access sports lockers are preferred by varsity athletic teams, professional sports organizations, and municipal sports leagues. These lockers are called “open access” because they do not have a door in the front. Instead, the upper shelf and main middle sections are open to the air and resemble small closets in both function and appearance. Most lines feature hooks and curtain rods that allow athletes to hang uniforms day clothes. The central section is large enough in most models to accommodate special athletic gear, such as baseball bats or hockey sticks, along with extra articles of clothing, footgear, and various other types of equipment. Smaller storage sections at the top and bottom allow for enclosed, secure personal storage of valuables. Models can be purchased in wood or steel. A new type of sports locker entered the scene several years back, and it continues to rise in popularity. Solid plastic lockers have become very popular for a wide range of athletic equipment storage applications. In particular, they have become the preferred locker type for public, municipal facilities. Solid plastic is a great deal more durable than most people assume, so it offers the advantage of vandal resistance to organizations that may experience occasional criminal mischief on their grounds. Solid plastic is also impervious to moisture, which makes any locker made from plastic simply ideal for a humid environment. Water parks, theme parks with large pools, and natatoriums typically invest in one of our many solid plastic locker lines because they keep clothing dry regardless of interior humidity. Many models also come with doors that allow users to secure personal day clothing and valuables while they are swimming. Due to the diversity of locker types in our inventory, it is possible for any arrangement to be created that will accommodate a specific group of users. Multiple tier configurations can be installed to handle large groups of customers in public facilities and a large student body in a public school. Single tiered sports lockers, which stand as tall as a person, are better suited to private clubs, stadiums, and official league teams. If you are uncertain as to which locker type you should purchase, send us a blueprint of your locker room and an estimate on the highest number of users you anticipate. We will help you find the right model and configuration for your application and your budget. This article was published on Saturday 24 November, 2012.